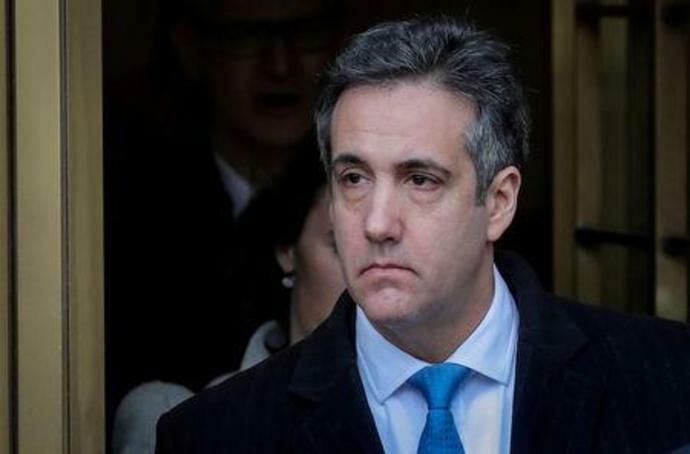 WASHINGTON (Reuters) - Testimony by U.S. President Donald Trump's former lawyer Michael Cohen before the House Intelligence Committee has been postponed until Feb. 28, the panel said on Wednesday, the latest snag over an appearance by Trump's one-time "fixer." Cohen, who is set to go to prison on March 6 after pleading guilty to crimes including campaign finance violations during Trump's 2016 presidential campaign, was scheduled to appear before the panel for closed testimony on Thursday. "In the interests of the investigation, Michael Cohen's testimony has been postponed" until Feb. 28, House Intelligence Committee Chairman Adam Schiff said in a statement. It was the second time this year a congressional appearance by Cohen has been put off. Last month, Cohen cited threats from Trump for postponing testimony before an open hearing of the House of Representatives Oversight Committee set for Feb. 7. That hearing has not been rescheduled. Cohen has also been subpoenaed by the Senate Intelligence Committee to appear in mid-February. In December, Cohen was sentenced by a federal judge in Manhattan to three years in prison for crimes including orchestrating hush payments to women in violation of campaign laws before the 2016 election. Democrats newly in control of the House of Representatives have planned numerous investigations of Trump, his business interests and his administration. Congressional committees are also conducting their own investigations of Russian interference in the 2016 U.S. presidential election on Trump's behalf and any cooperation between the Trump campaign and Moscow. Special Counsel Robert Mueller has been investigating Russia's role in the election and whether there was any collusion or obstruction of justice by the Trump team. Schiff said last month he wanted to discuss the Russia probe with Cohen in the closed testimony. Cohen was part of Trump's inner circle who in the past called himself the president's "fixer." After Cohen pleaded guilty to the Mueller charges on Nov. 29, Trump called his former lawyer a liar, "a weak person and not a very smart person." Donald Trump insisted he did not try to fire Robert Mueller, disputing an account given to investigators by former White House counsel Don McGahn. President Donald Trump is opposed to current and former White House aides testifying to congressional committees on Special Counsel Robert Mueller's Russia report, the Washington Post quoted him as saying on Tuesday. In an interview with the newspaper, Trump said the White House cooperated with Mueller's investigation into Russian meddling in the 2016 U.S. presidential election and did not need to comply with congressional committees, which are probing possible obstruction of justice by Trump.